We’re currently sitting 15 feet above the ground, in our boat, but “on the hard” – in Puerto Penasco, way at the northeastern end of the Sea. We spent most of the last month traveling up the western coast of Mexico (but inside of the Baja peninsula) in order to get the boat hauled out of the water for a new paint job. It was a full trip, with a variety of experiences, and some surprises! We try to stay in touch with the weather when we’re underway, using the morning ham radio nets. Actually there are two that we’ve been using, one of which, the Sonrisa net, is a ham net, and the other, the Amigo net, is a marine single-side-band net. SSB is very similar to ham, but with fewer requirements for training/credentials. The Sonrisa net begins at 7:30 and the Amigo net at 8:00. Both of them have weather forecasts 15 minutes later, so if all goes well we can catch two versions of the forecast each morning. However it turns out Murphy was a sailor, and it’s rare that we get both forecasts. Fortunately we are also able to get weather forecasts via internet, so whenever we are in cell range we can get that important information. The radio communication is affected by all kinds of factors, including weather, distance, proximity to obstructing objects, and solar activity, and it tends to degrade as the sun gets higher. We often hear some of the conversation but not all of it. Every day the net controller is someone else, so some days we are close enough to hear them, and some days we don’t hear them very well. On this trip, we frequently heard 3 boats check in daily who are on their way across the Pacific to the Marquesas Islands. That was pretty exciting! 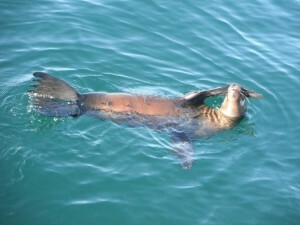 And we knew two of them from our travels in the Sea of Cortez last summer. 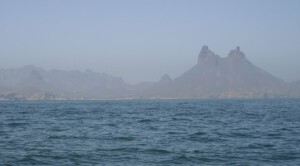 About 3 days after we left Banderas Bay, a strong northerly wind blew through, which was predicted well in advance. This weather pattern is pretty common in the winter and dies off as summer approaches. It brings with it very strong winds coming directly from where we were headed, and creates big waves over several hundred miles of fetch, so we decided that it would be more pleasant to be tucked out of the way than underway and decided to push to reach Mazatlan in time for that event. 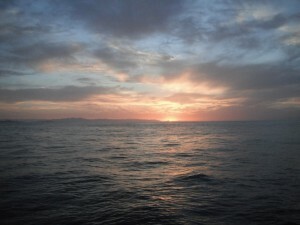 We entered the harbor in the evening, and anchored in the same place we’d been before, Club Nautico. This is the place where our dinghy was stolen, so we were a bit jumpy while we were there, but our stay was actually quite pleasant. We were there three days while the wind howled outside the harbor. We’re getting to know a few more places around town, and it’s “familiar” when we return. That’s kinda cool! We were ready to go, though, as soon as the weather permitted. And once it did, we jumped. We had another 4 days of lovely sailing. 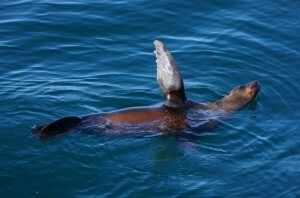 We saw a few sea lions on this leg of the journey, a first for us on this side of the Sea. They were very curious about the boat, and they would swim alongside for quite a while, checking us out. Several times we saw them doing something odd: they were floating along at the surface with their fins sticking straight out into the air. We had seen this once before in San Diego, from a distance, and we thought it was a carcass. But this time it was clear that they were doing this intentionally. Dan thought they were sleeping; Kathy thought it was more like sun-bathing. Whatever the intent, we thought it was cute! We also saw a lot of sea birds in this region, all the usual suspects but in larger quantities than before: frigates, pelicans, boobies, terns, and even gulls. At night the frigates and sometimes boobies would try to perch on top of our masts or the spring-stay that connects them. We wouldn’t mind, except that they make a mess down below, and every morning we’d wake up to a deck full of white patches. So we took to chasing them off whenever we could. We usually do this by shaking the shrouds from the side of the boat, which causes the mast and other stays to jiggle, causing them to lose their balance. But Dan figured out a new, very effective night-time technique: shining a very powerful flashlight at them when they circle around to land again. Presumably the bright light makes it difficult for them to find their footing on the skinny line. The frigates are very persistent, though, and will circle around repeatedly, frequently more than a dozen times! This game isn’t always a fun one for whoever was sitting watch at 3am! 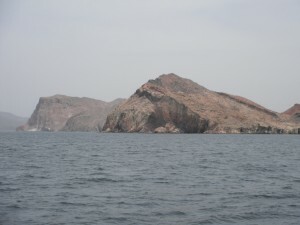 We spent the next night at an anchorage just north of Guaymas/San Carlos, and as we pulled in we saw that there was another boat already there. Shortly after we dropped our anchor, a young man on that boat dropped a surfboard into the water and paddled over to greet us. He wanted to know if we’d had a recent weather forecast. He and a friend were sailing around the area for a couple of weeks, and didn’t want to bite off more than they could chew. We told them that another northerly blow was due in a couple of days, and discussed a few possible places to “hole up” while it blew by. The next morning we took off again and motored the last several hours to make sure that we’d be in a well-protected place when the wind raged once again. Our starter has begun acting up again, and Dan had to go down below to give it a nudge. Immediately after the engine started up, the fishing pole let out a squeal: we had another fish on the line. This was another sierra: they seem to have a funny knack for biting at oddly inconvenient moments! When the boat accelerates right after starting the motor, the lure jumps in a way that seems appealing to a hungry fish – who ends up satisfying a hungry human instead! We reeled it in, cleaned it up, and popped it in the freezer for the next few days. We stopped along the southern side of the largest island in the Sea, called Isla Tiburon. Apparently it was a holy place for the indigenous people, and visitors are discouraged from exploring the interior very much. We only stayed 36 hours, but the winds really howled, ramping up from the late afternoon and through the first half of the night – we saw gusts of 38 knots, which is comparable to the fringes of Hurricane Paul last summer! Finally around midnight it peaked and began to settle out, although it wasn’t at all calm until almost dawn. We waited until the middle of the next day before we poked our nose around the corner and began heading north again. 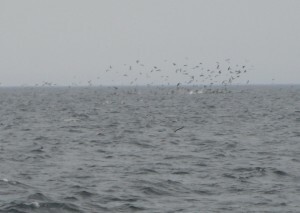 We had another great sail, and enjoyed lots of wildlife sightings, from huge pods of dolphins to squadrons of birds plummeting down on a roiling bait-ball of fish. 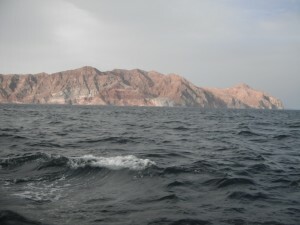 There were a number of islands around, but we stayed several miles off. We arrived about a week earlier than we’d expected, so we needed to find a place to wait until we could get into the boatyard. We had heard that there was a big side-tie slip that was not used during the week, while the resident boat was away on passenger trips. So after looking around for other likely candidates, we pulled up to this slip. The dock was completely covered with pelicans, so when Kathy jumped off Lungta to tie off our dock lines, it was very slippery with at least 1/4 inch of slimy pelican poop covering the entire surface – yuk! A guard came down the ramp, though, and told us that we could not stay, even for a few hours while we looked for another place. So we pulled away again. We were unable to find anything else, so we just dropped anchor off to the side of the harbor’s center. We reinflated the dinghy and dropped it in the water, found the boatyard and met our contact there. He gave us a quick tour of the place and told us that they could get us in at noon the next day. We checked in with the harbor-master who told us it would be OK to leave the boat where it was until we hauled out, so we went home and fell into bed for several hours of restorative sleep. It was good to be in a calm harbor again after sailing the entire length of the Sea of Cortez without once getting off the boat.